Personalized Carabiner Chapsticks Custom Printed in Bulk in Full Color. Promotional, Inexpensive. Bargain Prices for America. SPF15, All Natural, FDA Approved. SPF 30 soy lip balm chapstick tube with carabiner clip. All Natural: Beeswax and soy base. PABA Free. 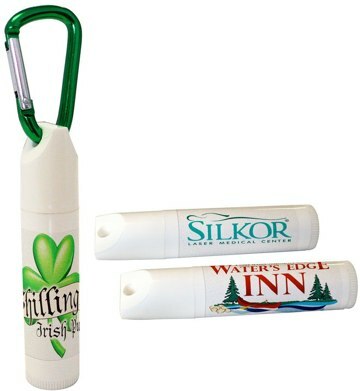 The carabiner chapstick is an excellent item for trade show giveaways, hotels, spas, salons and outdoor events. Budget Prices in the USA or Canada for wholesale carabineer chapsticks. American clients pay no taxes. Setup Charge: $45.00 for any number of colors; $25.00 on re-orders. Production time: 5-7 days after art approval. Rush production is available: contact us. Size: 2-5/8" H x 5/8" Diameter. Flavors: Berry, Bubble Gum, Cherry, Chocolate, Cinnamon, Coconut, Cola, Cool Ice (Mint and Menthol), Granny Smith Apple, Grape, Island Paradise (Pina Colada), Medicated (with Menthol), Meyer Lemon, Mint, Mocha, Orange, Peach, Peppermint, Pineapple, Pomegranate, Romantic Wish (Watermelon Vanilla), Root Beer, S'mores, Strawberry, Tropical Mint, Vanilla, Unflavored, Watermelon. • Imprint area: 1-3/4" x 1-1/8"